Woking Snooker Centre's PAUL BUNYARD captured his fourth snooker championship title in a pulsating final last night at the West Byfleet Social Club. He started the best of seven frame final against Guildford's RYAN MEARS in sensational style with a break of 64 (8 blacks) on his first scoring visit. RYAN responded with a run of 19 before a 55 clearance put the champion one up in a blink of an eye. Any respite for RYAN was to be delayed as PAUL knocked in an early 54 in frame two. RYAN got to 26 but broke down leaving PAUL to clear up to the pink to increase the points score line. It was 2 -0 and Paul was not missing. RYAN dug deep in frame three keeping chances to a minimum and starting to get his eye in. A low scoring frame was edged by RYAN when a whitewash looked ominous when the frame began. RYAN quickly gained confidence and dominated frame four with an excellent break of 71 to level the match at 2-2. The four frames had been played at breakneck speed but now it was crunch time. RYAN got in early with a 33 and soon increased his lead to over 40 and with many reds on cushions he was favourite to go ahead. PAUL carved out a superb break of 36 and took his chances on the colours to go 3-2 in front. This seemed to spur PAUL on and he soon recaptured his first frame form. An early 55 putting him firmly in the driving seat. RYAN launched a comeback and got to 16 with two reds and blacks but in playing an excellent cannon onto the pink to bring two of the last four reds into play the cue ball ran safe. He gambled on potting an extremely difficult cut red and left an opportunity that PAUL was not for giving up. 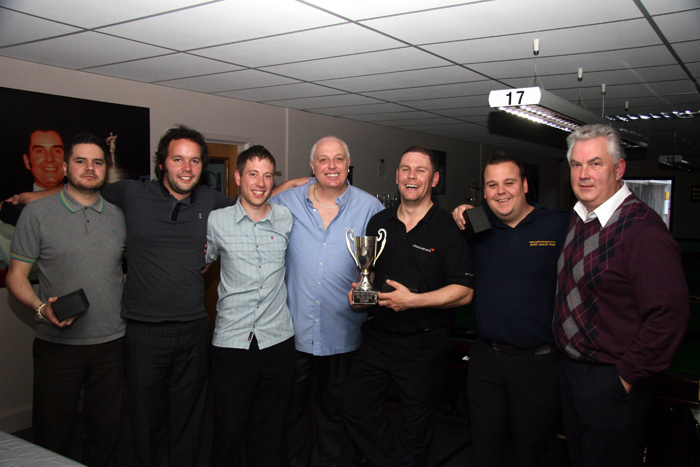 He finished the match in style with a 32 to retain the title of Byfleet Snooker Champion. A magnificent match full of high quality and dramatic snooker. Congratulations to both players but there can only be one winner so PAUL BUNYARD take a bow. TERRY TEEMAN did a great job refereeing and did remarkably well to keep up with the rapid potting from both players. Thanks also to IAN GELDARD for use of West Byfleet's snooker room. A perfect venue for a great final. Scores: 119(64,55) - 19, 80(54) - 26, 39 - 57, 8 - 75(71), 75(36) - 40(33), 100(55, 32) - 16.